Rooms at Maduzi are designed to provide 4Cs – Comfort, Clean, Convenience and Calmness. All rooms are equipped with Jacuzzi, espresso mahine, Bose sound system with CD/DVD player, aroma amenity and more. Everything you need to make yourself at home is right at your hands in each room. Services at Maduzi are personal and tailor-made for you. HOME stands for Helpful, One-stop, Mindful and Enjoy. Every single staff at Maduzi is there for you to be helpful and provide a mindful and one stop service to make your stay enjoyable. Please feel comfortable with asking for assistance even though it may be ever so small. All the guests at Maduzi are invited to enjoy following complimentary services. FLEXIBLE CHECK-IN AND CHECK OUT TIME from 7am to 6pm as long as the room is available Let us know in advance so that we can put your request in priority. BREAKFAST IS SERVED UNTIL 2:30PM so that you never have to miss the breakfast to start a great day. The last order is 30 minutes before the closing time. It is available both at the restaurant on the first floor and in-room. 24-HOUR BAR SERVICE. Welcome drink of your choice can be redeemed at anything during your stay. We brew coffee or tea fresh at any time of the day for in-house guests for free. 24-HOUR GUEST ASSISTANCE by just dialing “0”. FREE IN-ROOM MINI BAR with soft drinks and snacks. If you would like alcohol(extra charge)in the mini bar, please let us know in advance. 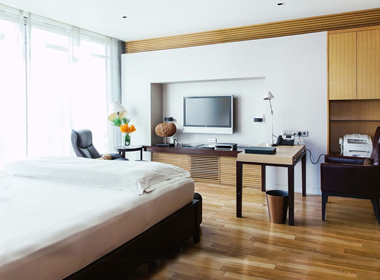 Maduzi Hotel Bangkok is a one-of-a-kind conceptual hotel offering the ultimate privacy and tailor-made services. With our reservation-only policy which prohibits any walk-ins, Maduzi Hotel Bangkok can cater to the exclusive needs of our guests, be it business or as your own private getaway. The 40-room Maduzi Hotel Bangkok is truly a boutique destination in Sukhumvit for the most comfortable and tranquil experience with personalized services. The interior designed in a unique Thai and multi-cultural mix reflects the owner’s heritage, and luxurious rooms fitted with top amenities offers a private home away from home for globe trotters. Warm, elegant and classy, Maduzi Hotel is one of the best boutique hotels in Bangkok. Maduzi is loved for its great central location in Bangkok. Very close to shopping, restaurants and night life.